On Sunday night, as Tiger Woods’ putt fell into the cup at No. 18, I took off fast as I could out the back door of Augusta National’s press center. I started my tape recorder. I dropped it in my pocket. And I took in the scene. When I listened back later that night, and again on Monday, I realized: it was the best move I made all week. A replay of the audio brings me back to that intoxicating scene. As I reach the grounds, the sounds of euphoria hit me, 10 thousand patrons strong, at least, captured on a muffled microphone deep within my pocket. If you’ve ever known the agony of escaping from a crowded sporting event, picture the exact opposite experience. In the Augusta Tapes, it sounds like everyone’s team has won. 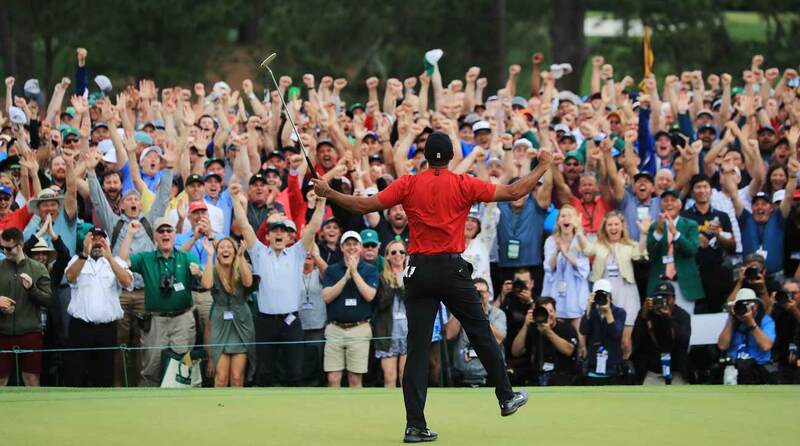 The mood, the chatter, the pure elation: it all comes through as a sort of high-pitched buzzing, broken up by gleeful shouts and high-fives and one shriek of “Tiger! Ow oww!” This is no beat-the-traffic rush; they’re walking together calmly. The March of Tiger. None of them want to leave. Tiger Woods' Masters win meant an awful lot to an awful lot of people. There’s some rustling in the audio, then a series of my thudding footsteps on grass, then pavement, and the next voice that registers is that of Rob McNamara, the least-known member of Team Tiger but perhaps the man closest to The Man. He rarely gives interviews. But now here he is, talking animatedly as he walks through the clubhouse, swept up in the moment, reminiscing on the past. “It’s been a lot of years — I’ve been with him since 2000,” he says. “He hired me, but I started with him on IMG, just on his account.” This win has everyone turning on their time machines. McNamara happily fields question after question. My footsteps leave the patio and head in the direction of Butler Cabin, and there’s a roar going up now, and then a chant: “Ti-ger! Ti-ger!” The chant is faster now, frenzied, frantic. He’s on the putting green, with Patrick Reed, reveling. The green jacket ceremony was supposed to be cancelled, the fans were supposed to be forced off property, yet here they are, the ones who’d refused to leave, and they’re chasing after Tiger as he leaves the green, running (gasp!) at Augusta. The roars follow him like a wave, and so do the people, and for a moment it seems like they might swarm Woods until security fends them off. One fan screams out to Woods as he gets further away, just before he climbs into a van. “Tiger! You’re gonna win another one next year!” His voice cracks on the last word, and everyone laughs, and cheers. More footsteps. Some raindrops now, too. Then comes the voice of Woods’ caddie Joe LaCava. LaCava typically slips away after rounds; he’s a man of few words and makes it a point to deflect credit. But now he’s posted on the back tailgate of Tiger’s courtesy car, a Mercedes SUV, holding court, taking questions for a half-hour or more. There’s another voice, and a high-five. “What’s up, big money?” LaCava asks. Patrick Reed’s voice responds. “I didn’t mess it up!” He cackles with glee; today, even the defending champ is giddy in defeat. 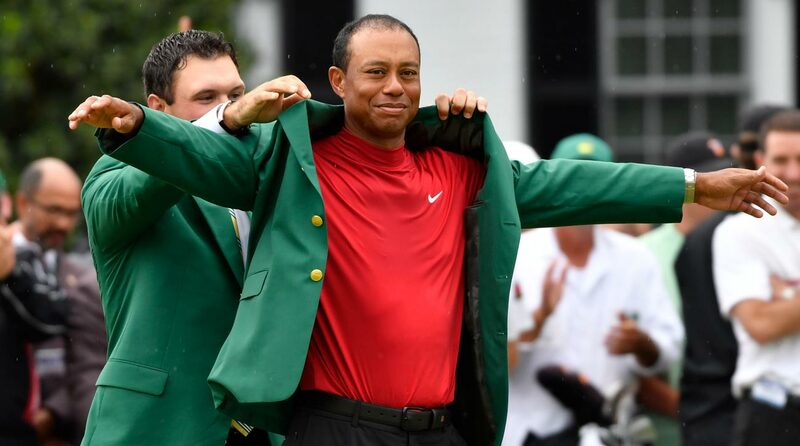 Patrick Reed helps Tiger Woods into his green jacket Sunday at the 2019 Masters. The recording runs out, and I’m left with my own thoughts, wondering about the importance of the man, and the place, and the moment. Why did everyone stick around to celebrate, to drink in the scene? Why did I? The power of the moment transcended those on property. It sent a charge through the stoic set of Tour pros, not just those that stayed around to soak in the revelry. Stories poured in from across the world on Sunday night and into Monday of just what Woods’ win had done to people. Fans in attendance, craning their necks for a peek at the man in red, jumping in the air when his final putt disappeared. Families huddled together, bawling in front of their TV sets. A video appeared later that night from a watch-party celebration a golf club in Nigeria. Sure, Michael Phelps had a front-row seat in person, but other GOATs watched from home: LeBron James, Serena Williams, Tom Brady. This mattered. Why does Tiger Woods winning inspire such a reaction? It’s more than his athletic brilliance, obviously, though that’s a baseline: we all want to be witnesses to the very best. But Woods matters because we know him, and because we have known him. He matters because he set a goal some four decades ago, to chase down Jack Nicklaus. And he matters because he’s still at it. This was a win for having goals, for going through bad times and coming out the other side. Think of something you really wanted when you were three years old, or a project you started in 1997. Well, how’s it going now? Chipping away at it every day? Woods’ frailties have made him more relatable in recent years, but it was always his superhuman determination that inspired awe. He started something and he wants to finish it. The illusion here is that we hardly know Woods at all. We know very little about what he’s been through, and what he really wants. But here’s what we do know about him: He cares. And he tries. That much has always been true. That’s why the moment on the 18th green was so important. Woods didn’t try to play it cool. He unleashed a guttural, visceral reaction, years and years of caring and trying pouring out all at once. Sports fans want permission to care; we want those we’re rooting for to be as invested as we are. Permission granted. Woods allowed us to be happy for him. Woods’ redemptive arc matters here, too. You remember the scandal of a decade ago; it’s less likely you recall how long the backlash lasted. Woods wasn’t always as adored as he is now. As recently as 2013, Woods was third on a Forbes list of “Most Disliked Athletes” with a 19 percent approval rating. But there’s only one thing America loves more than tearing down its stars: Rooting for its underdogs. Somehow, that’s what Woods had become. And the way he set up his comeback: as a golf-only look to the future. As a result, his public redemption could only come one place: on the final hole of a major championship. We didn’t know if it ever would. The most important part of his answer was that he answered at all; in doing so, he acknowledged that he was not just Tiger Woods but a person who has struggled. That such greatness and redemption could exist in someone with such ordinary problems gives hope to the rest of us. Getting through hard times demands hard work, Woods said. I can still hear the sounds that followed that moment at Augusta. The sounds trigger the feelings; they help me see the joy, smell the nostalgia, feel the satisfaction. It mattered, truly, to Woods. It mattered that he never gave up. And that’s why it mattered to the rest of us.